Opace would like to wish all of our customers a Happy New Year and many thanks for your business in 2015! Our last post provided 25 essential SEO and online marketing tools to consider for your business in 2016. In this article the focus is on our top four web design and SEO improvements that you can make during 2016 to get ahead of the competition. New Year is a great time for planning and seeking improvement. Why not resolve to improve your site’s SEO with an Opace SEO audit? Do get in touch with us here at Opace if you believe your website is in need of a content refresh. Perhaps your current web design is tired or maintenance is difficult and a Content Management System (CMS) is needed? If so, Opace can help with a band spanking new website design, a great way to start the New Year? Opace work with cutting-edge open source content management solutions such as WordPress, Joomla and for eCommerce sites we specialise in Magento. Web design projects take significant amounts of planning, design and implementation, Opace can help you with all aspects of a web design project to ensure it’s a success. 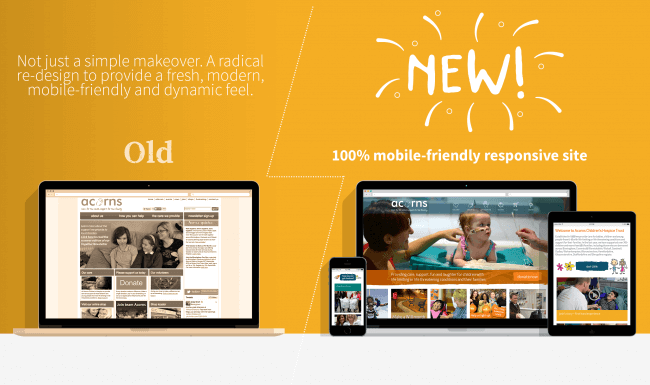 2010 to 2015 transition of the Acorns website. So why not get the New Year off to a great start and invest in some new web design and SEO strategies, guaranteed to deliver a great ROI for your business!